In response to market demands and shifting priorities, the mining industry continues to evolve, both in Canada and internationally. Mining companies that want to keep pace with ongoing change – or better yet, lead the charge – must ensure they understand the intricacies of the multiple aspects of mining development, as well as the associated implications for their bottom line. Accessing and using capital effectively remains a priority. To expand existing operations or take advantage of new opportunities, it’s critical for mining companies to have a thorough understanding of the financing options available and the most efficacious ways of structuring them. On another front, engaging with community and Aboriginal stakeholders and addressing ever-changing environmental and regulatory concerns are vital components of mining exploration and development, and must be approached with acumen, insight and skill. The Mining Group at Osler has the depth of experience and breadth of knowledge to advise domestic and international mining companies on these issues and any other matters they face through every phase of the business cycle – from initial exploration to the establishment of large-scale operations. Our lawyers have acted for mining companies of all sizes, specialties and stages of development, and can offer the legal expertise required to support and guide clients so they can achieve their operational and strategic business objectives efficiently and cost-effectively. Top mining companies from around the world regularly seek out the counsel and advice of Osler practitioners to help them overcome challenges, resolve their issues and meet their business needs – from corporate finance to regulatory matters to labour relations. Osler lawyers have acted as lead counsel on a number of substantial mining M&A transactions, making them well-positioned to advise on the various facets of such deals. In addition, they can share the specialized insight they have gleaned through hostile bid defence mandates that have resulted in some of the most accretive value results. The regulatory regime governing the industry is complex. Osler’s Mining Group can help clients navigate the evolving landscape and ensure that they understand and are complying with the applicable requirements, including those related to mining disclosure (National Instrument 43-101), mineral and surface rights, and environmental standards. Our lawyers also have recognized expertise in Aboriginal law and can advise on the obligation to consult with First Nations affected by mining exploration and the need to respect treaty rights. In addition to the regulatory hurdles that must be considered when establishing new mining projects, companies often face challenges related to the lack of infrastructure and the shortage of skilled labour. Osler’s team can lend its infrastructure and construction experience to those projects and our employment lawyers can help companies address any labour relations issues that arise. Osler practitioners also provide mining companies with guidance on financing projects as well as advice respecting taxation issues and the optimal way of structuring their operations. Finally, when companies run into issues related to exploration and development that they cannot resolve on their own, they can turn to Osler’s dispute resolution and litigation experts for direction and guidance. Lenders and underwriters in the acquisition of Dominion Diamond Corporation by Washington Companies Corp.
BMO Capital Markets in connection with the offering on a bought deal private placement basis of an aggregate issue amount of $10,000,260 Subscription Receipts of Cordoba Minerals Corp. The underwriters in a $1.44 billion offering by First Quantum Minerals Ltd.
Goldcorp Inc. in the successful defence against a claim brought by Barrick Gold Corporation in respect of Goldcorp’s acquisition of a 70% interest in the El Morro mining project in Chile. A consortium of buyers, led by POSCO of Korea, and including China Steel Corporation of Taiwan and certain leading Asian financial institutions, on its $1.1 billion purchase of a 15% interest in ArcelorMittal’s Canadian iron ore business. Equinox Minerals Limited in its proposed $4.8 billion offer to acquire Lundin Mining Corporation, in its defence of a $6.3 billion unsolicited take-over bid from Minmetals Resources Limited, and its $7.3 billion acquisition by Barrick Gold Corporation (the largest M&A transaction in Canada in 2011). Kinross Gold Corporation in its $7.1 billion acquisition of Red Back Mining Inc. by way of plan of arrangement (the largest M&A transaction in Canada in 2010). "Clients believe that the firm's "understanding of balancing business needs with legal rights enhances its ability to provide support." "Whether it's a live deal or not, they are extremely responsive, helpful, and their advice is right on the money. They're always willing to be a sounding board on potential issues, and very proactive in highlighting changes to legislation that might impact our transactions." "They have a great culture and client-centric approach. The lawyers have great technical ability coupled with a good sense of judgement of how legal advice needs to marry up with underlying business objectives. They collaborate internally and externally very well." For over a decade, Osler has consistently been given the highest possible ranking (Tier 1) in the guide for Corporate/M&A. The Canadian Legal Lexpert Directory, 2017-2018: Toronto, Ontario, recognized Osler’s Mining Group in the area of Mining. In addition, for the past nine years, Osler has also been recognized by The Canadian Legal Lexpert Directory as one of the “most frequently recommended” Toronto firms among the Mergers and Acquisitions practice. The Canadian Legal Lexpert Directory, 2018, Calgary, Alberta, Repeatedly Recommended in the area of Mining. 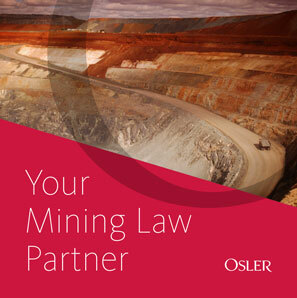 Several Osler lawyers are named “Leading Canadian Lawyers in Global Mining” in the Lexpert Special Edition on Mining. The Legal 500, 2019: Energy - Mining. The Best Lawyers in Canada ranks Osler as the #1 firm in the Ontario and Ottawa markets in Mergers and Acquisitions, by total number of ranked lawyers. Who’s Who Legal: International & Canada 2019: Osler lawyers recognized in the area of Mining.